Lady Bird Johnson, wife of President Lyndon Johnson, died last week of natural causes after years of health issues. The former First Lady, born Claudia Alta Taylor, was known throughout Texas and the United States as being a major architect for numerous beautification and conservation programs. Lady Bird was also one of the most decorated First Ladies in the history of the United States, having been awarded the Presidential Medal of Freedom in 1977, and the Congressional Gold Medal in 1984. Lady Bird grew up in Marshall, Texas, was born to a successful businessman, and a mother who died when Lady Bird was just five. The future First Lady graduated from the University of Texas with two degrees - one in Arts and the other in Journalism - in a time when few women were expected to even attend college, let alone work. Lady Bird met her future husband while both were working in Washington. They went on exactly one date before the future president proposed marriage. The couple was then wed in San Antonio at St. Mark’s Episcopal Church. Lady Bird was known to be an extremely reluctant public speaker, even going so far as to purposefully lower her grades in high school so as not to be named valedictorian and have to give a speech. By marrying a man with a budding career in politics, though, she was eventually able to overcome her fear, and join her husband on the campaign trail, giving speeches of her own. As First Lady, Mrs. Johnson pushed many beautification projects through, and was responsible for publicizing the Highway Beautification Act to limit billboards and plant vegetation along America’s highways. She used her position to raise money for beautification programs in Washington, and at the age of 70 (in 1982), Lady Bird founded the National Wildflower Research Center outside Austin, which was later renamed in her honor. Lady Bird was a true environmentalist, and a pioneer for the cause of conservation. The later years of her life were troubled by sickness and health problems, yet she persevered. Although she suffered a stroke in 1993 which eventually left her legally blind, the former First Lady still made occasional public appearances, even as recent as an announcement for renovation of her late husband’s library in October, 2006. The last couple of years saw her in and out of hospitals, and though bound to a wheelchair, also made an appearance at the White House in 2005. 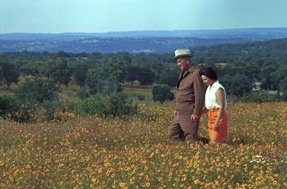 Lady Bird loved driving through Texas and seeing the wildflowers in bloom, which was one of the driving forces behind so many of her projects . . . wanting to make all the nation’s highways, as beautiful as those in her beloved Texas.